1.0.1 How does a sprinkler work? 1.1 At what temperatures is a sprinkler automatically activated? How does a sprinkler work? The most important components of a sprinkler system are the network of distribution pipes and a dedicated, guaranteed water supply. The sprinklers are spaced according to the fire risk and are located in the branch pipes. In the event of a fire, only those sprinklers in the immediate vicinity of the fire are activated. The sprinkler incorporates a glass tube containing a special fluid and a small amount of air. If the temperature increases, the fluid expands in the glass tube. The pressure continues to build until the air in the glass tube is absorbed. If the temperature continues to rise, the pressure increases rapidly, causing the glass tube to shatter and the seal to be broken. A shower of extinguishing water is then distributed evenly over the seat of the fire. At what temperatures is a sprinkler automatically activated? 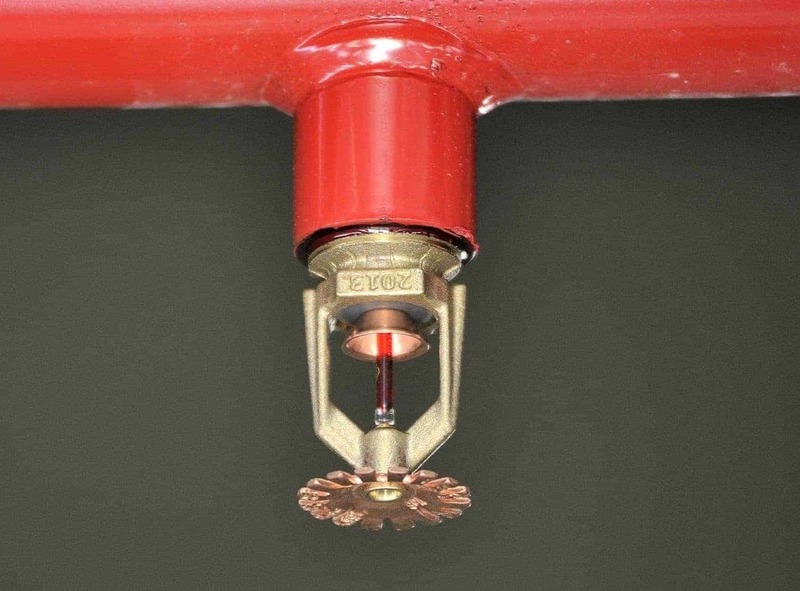 The ambient temperature is the crucial factor for sprinkler activation. The sprinkler reacts when reaching a specific limit. This depends on the type of sprinkler. This graphic explains how the entire sprinkler system works. We offer the ideal solution for the specific demands applying to standard and high-bay warehouses. The sprinklers are installed directly on the shelves to ensure efficient fire protection. Each area is separated off using columns made from non-flammable material. 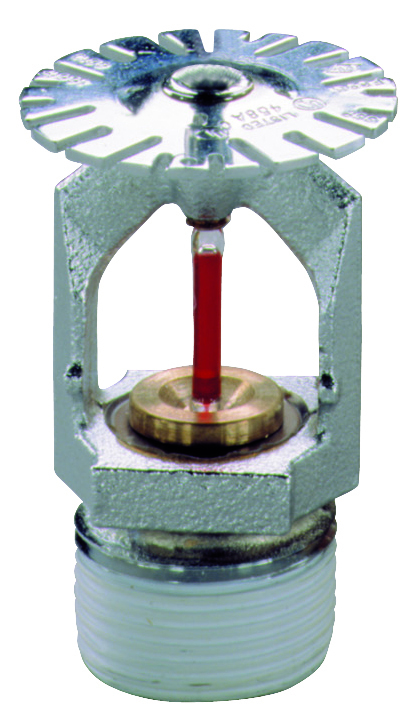 This enables accurate extinguishing using the sprinklers installed in the relevant area. The fire is suppressed immediately and cannot spread to other sectors. Quick-action suspended sprinklers that are activated at 68°C are normally installed for this purpose. 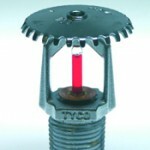 Dry systems are used in areas at risk of frost where the extinguishing water already in the sprinkler pipes may freeze. In such systems, the network of pipes exposed to temperatures below 5 degrees is filled with compressed air from the point of the triggering sprinkler head onwards. When a sprinkler head is activated, the system is immediately filled with water. These sprinklers can be installed suspended or standing. The spray plate is designed so that the areas both above and below the sprinkler are sprayed. 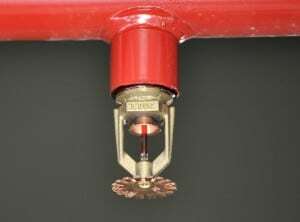 This type of sprinkler is ideal for flammable ceilings. The most common type of sprinkler. Standing sprinklers are used when the pipework is visible. Suspended sprinklers are always used when the pipework is hidden. These sprinklers are mainly used for aesthetic reasons to keep ceilings free of pipes or prevent the damage that can be caused by installation on existing ceilings. A fire inevitably produces toxic gases that are more dangerous to humans than the actual flames. Fast-response sprinklers have an extremely short response time that enables a fire to be detected and fire-fighting to start quickly. This prevents high temperatures and the creation of dangerous pyrolysis products, thereby gaining valuable time to save lives.